In every industry, especially construction, everything is changing quickly – the technology, the operational impacts because of technology, the expectations, and perhaps most drastically, the workforce. As we look to hire the next generation, retain existing workforce and ensure lasting relationships with the trade contractors that make our work possible, we realize that we have to change too. In a traditional sense, construction can be hierarchical from a decision-making perspective. Bids are sent, contracts are signed, and trades arrive onsite to be told where to work – but there is a better way. 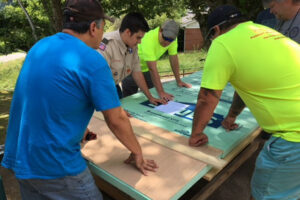 Josh Farr with members of his project team participating in a project benefiting a local philanthropy. Each trade repetitively completes the tasks necessary to perform their scope of work on variety of projects and has likely been completing those same tasks for a number of years. Whether new or seasoned, each craft professional is trained for their specific trade. They know exactly how long it will take to complete a task, how many people it will take to do it, and they often have thoughts on how they could do it better. As a construction manager, why would we not capitalize on their expertise and creativity? On all of my projects, we utilize the Last Planner System, which is essentially a Lean, collaborative scheduling tool. From the beginning of the project, I discuss schedule durations with all of the trade contractors and build the Overall Project Schedule (OPS) with them. Once construction begins, we have a weekly schedule meeting to discuss the next six weeks, and a daily stand-up meeting every morning to discuss the day’s work, constraints and upcoming material delivery. By opening these lines of communication and gathering input from each of the trades, project efficiency significantly increases. While scheduling is a critical aspect of daily and weekly meetings, these conversations also allow everyone to get to know each other. Our meetings begin at 7:30 a.m. every day, and as everyone arrives, you’ll hear them talking to one another. On every new project, it’s always amazing to hear conversations evolve from small talk to deeper discussions. And as relationships evolve, the conversations during the daily stand-up also become more constructive. The trades begin talking among themselves, resolving issues. Trust develops. But these friendships don’t happen just because of a meeting. Implementing tools and a sound meeting structure on a project is great, but they’re just tools if you don’t have a positive, collaborative culture. The first step to creating a positive culture is being an uplifting leader. From the moment I begin working on a new project, I do my best to communicate to the trades that I’m here to help them, not push unrealistic deadlines on them or take their profit. I try to help them look ahead at their work and address any foreseeable constraints they may experience. Most importantly, I want them to trust me and know that I want them to succeed, I want the project to succeed, and I want our client to be happy. Teambuilding is another aspect of growing relationships onsite. It could be as simple as catering in a lunch for the project or scheduling a team activity. Creating opportunities for team members to share a meal and talk about their lives outside of work often elevates relationships from co-worker to friend. For me, it provides an opportunity to get to know each member of the team personally, so they can see I appreciate them not only as a teammate, but as an equal partner in the success of the project. In addition to benefiting from a great work environment, other things begin to happen. Safety improves because people are more likely to watch out for their friends than strangers. The quality of installation improves because team members feel like they are an active part of ensuring the owner is happy with their work. There are fewer surprises because the team feels more comfortable being transparent, talking about problems they may be having. Finally, less of your time is spent being a mediator between trades that are in each other’s way or can’t get along. By working to connect the trades and build a team, they often end up resolving issues among themselves. Employees work for more than a paycheck. They crave engagement and to be a part of something meaningful. The goal is to build a team that respects and trusts one another. When you establish this culture onsite, it’s amazing how much better the building process can be. It gets done, and it gets done right.